Novelist Akhil Sharma grew up in a teetotaling Indian household. 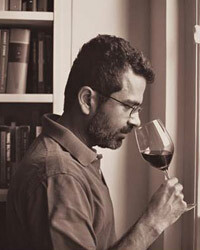 Here, he tells how discovering a passion for great wine helped him create a new identity out of a painful past. p>My parents are careful, frugal people. They do not drink, and among the ways that I used to think of myself as different from them, one was that I drink, and that I drink enough and care enough about wine that I am willing to spend thousands of dollars a year buying and putting away wine. It makes sense to me that I have tried very deliberately to separate myself from my parents and from my childhood. Lately though, I have begun thinking that most of my better qualities come from my parents, and this realization is, for me, unexpectedly comforting, soothing a loneliness I had not even known I was experiencing. If my parents have a favorite virtue, it is probably loyalty, and the reason my parents do not drink is because drinking seems, to them, a show of disloyalty toward their sense of what it means to be Indian. My parents came of age around the time of India's Independence, and for them and many like them—middle-class men and women, among the first in their families to go to college and largely belonging to the lower ranks of white-collar work—drinking alcohol was considered unpatriotic. This was partially because beer and whiskey, the two types of alcohol that middle-class people typically drank in India, were both associated with the British. Partially also it was considered unpatriotic to drink because the Independence movement had an ascetic religious strain. While loyalty might be my parents' favorite virtue, to me loyalty meant responsibility, and responsibility meant being crushed. This is because of my brother. My family came to America in 1979. I was eight then, and my brother was 12. Two years after we arrived, my brother had an accident. Anup was about to turn 14 when, one August afternoon, he dove into a swimming pool and hit his head on the pool's cement bottom. He was a skinny, curly-haired boy, and the blow stunned him, and he lay there underwater for three minutes. A life­guard pulled him out, but because of the three minutes, my brother was severely brain-damaged. He was no longer able to walk or talk. He could no longer roll over in his sleep. For a year Anup was in a hospital, and then for another year he was in a nursing home. At the nursing home, after discovering one morning too many that Anup had lain on his side all night so that tears were running from his eyes, and after finding one time too often a careless orderly's latex glove in Anup's bed, my parents decided to bring him home and take care of him themselves. Today, 26 years later, Anup lies on a hospital bed in a room in our house with a gastrointestinal tube coming out of his side. His body is swollen from the medicines he is given for convulsions, and growing up seeing his suffering and my parents' suffering made me want a life that was nothing like theirs. The first type of alcohol that i learned an inordinate amount about was beer. This was in graduate school, and my roommate, Rob, a small, round, gray-haired man with mild eyes, used to brew his own beer. He did this in a quarter-keg that he kept in a closet and that he dressed in layers of undershirts and sweaters so a sudden drop in temperature wouldn't stop the fermentation. We were living in Palo Alto, California, and most weekends, Rob and I used to drive all over the San Francisco Bay Area to wherever Rob had heard of a good brewery. My parents lived in New Jersey, and because I had gone to college there, this was the first time I was physically far enough away from my parents that I could not drive back home and help care for my brother. It was only in California that I even realized that this was exactly what I had been feeling, that no matter what I was doing, I should hurry up and get back home and help. To be in California and free of this nagging guilt was exhilarating. Rob and I would whiz down highways and drop into small towns and get lost, and then find the breweries that we were searching for. In my memory, these drives on sunny weekend afternoons and the beers that we drank, light as lemonade or dark as old motor oil, somehow fuse into a sense of a wide world waiting to be explored. The second type of alcohol that I learned a lot about was wine, and here too, my interest seems to have been motivated by wanting to escape what I had grown up with. Most immigrants worry about money. When I tell immigrant friends that on the rare occasions my family went out to eat, my parents would order their Cokes without ice just so they could have a larger amount to drink, my friends laugh in recognition. For my family, the pressure of money was enormous. We needed to hire nurses to take care of Anup, one nurse in the morning and one at night. But our insurance and the other resources we had were very limited, and because we could not pay as much as nursing homes and hospitals, the nurses that we got were often ones who were either no good or who had already maxed out their overtime at their primary employer. We had nurses who fell asleep sitting beside my brother in his hospital bed; we had nurses who stole from us. The concern about money was constant, and so was the sense of being poor. I remember getting a varsity letter in high school and feeling embarrassed that other students on the track team might wonder why I did not buy a leather jacket to sew the letter onto. I became interested in wine while I was at law school, and the first wine that made me happy was actually one that I did not finish. Spending money had always felt vaguely artificial to me, like I was speaking in a foreign language. Still, as a form of discipline, once I started earning money I made sure to spend it, and one night, during dinner at a restaurant, I ordered a bottle of red wine. After drinking perhaps two glasses, I realized I shouldn't drink any more because I had to drive. I left the bottle behind, and late that night, in the same way that sunlight leaking into a room can wake you, I slowly woke from happiness. I lay in bed in my room and could not go to sleep again. I lay there and felt amazed that I had enough money to spend $35 on a bottle of wine (I remember this exact amount from 12 years ago) and not feel overwhelmed by the pressure of having to finish it. Since that bottle, i have spent a lot of time and money learning about wine. In a blind tasting, I can usually tell a Russian River Valley Pinot Noir from one from the Sonoma Coast. I know to say, and I actually do believe, that Chenin Blanc is the most underrated grape in the world. The pleasure of wine, though, has changed for me over the past 12 years. In the very beginning, what I valued most about wine was status. I became an investment banker after graduating from law school, and I loved going to the Sotheby's wine auctions in the winter. These auctions often occur after the investment-banking houses have paid their bonuses, and when you go to them, the auction halls are full of excited young men with slicked-back hair waving paddles. For me, the pleasure of acquiring wines at auction was not so much in owning the wines, or in drinking them later, but in spending money in front of other people. Everybody likes to appear special and to be thought well-off, and I think immigrants are especially susceptible to this desire. I have several Indian friends who, when they leave their homes, even to go run errands, put on collared shirts and nice shoes so that no one will think to ask them if they speak English. While for many immigrants, doing such things is a way to signal something to the outside world, for me there was so much guilt about living my own life that it seemed hard to think well of myself without linking my identity to expensive objects. Thank god, people change. over the years, i have become a little more at ease with myself. Probably the most important reason for this change has been getting married and loving my wife, and accepting the fact that she is smart and so there must be a reason why she loves me. This change has been matched by a shift in my relationship to wine. Among my parents' good qualities is that they tend not to place people in hierarchical orders. Perhaps because they are religious and see everyone as a flawed creation of God, they tend to listen to both rich and poor, educated and uneducated, with pretty much equal care. Even as a child I was aware of how special this quality was, and lately, I feel I have begun acquiring this ability myself. Partially, this manifests itself in my appreciating different wines for what they are, instead of the status they might or might not confer. Recently, I drank what I believe is one of the great wines of the world. It was a Chardonnay from Burgundy, and as I sniffed and tasted the wine, its different flavors—hazelnut, acacia, apricot—appeared slowly and one by one, like a bell tolling or like characters in a play walking out onto a dark and empty stage. While at one point I would have tasted this wine and immediately wanted to boast about being the sort of person who gets to drink a wine like this, now I felt humbled. I drank the wine, and I had a sense of how difficult it must have been to make a wine that carried its complicated self so simply. I thought of all the people who had helped make the wine in the vineyard and the cellar. I thought of all the luck that must have gone into the making of this wine as well, because there were other great winemakers working in the same vintage and in this same legendary vineyard. I thought of all this, and I didn't feel any desire to talk about myself and my knowledge. Instead, I just felt lucky. Akhil Sharma, author of An Obedient Father, was chosen this year as one of Granta's Best of Young American Novelists.